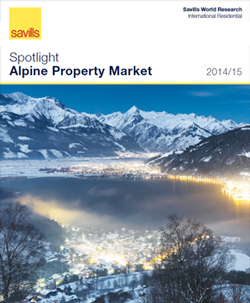 According to Savills World Research and Alpine Homes in the Alpine Property Market Spotlight released today, more alpine sales are taking place at lower price points as the resilience of the ultra-prime markets start to ripple down the market price ladder. Jeremy Rollason, managing director of Alpine Homes says, "12 months ago, we predicted prolonged periods of sunshine and blue skies for the Alpine property market. This may have been a somewhat easy prediction, given a recovering world economy, increased confidence and job security and in the case of UK buyers, a steady strengthening of sterling." Rollason continues, "The Alpine property market however continues its upwards trajectory in terms of increasing sales volumes, up 52% year on year, although this does not necessarily mean rising prices. 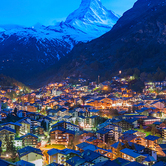 While buyers are more prolific for the above reasons, prices in the Alps have not generally kept pace with house price increases back in the UK, particularly in London." Switzerland's position outside the EU cements is appeal as a safe haven for wealth and as such resorts carry a price premium. 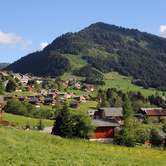 In the case of Verbier, values can reach €22,400 per sqm or 80% more than the average. 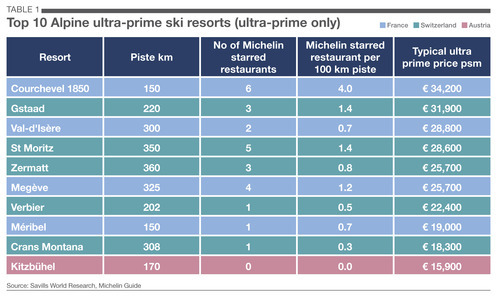 It's therefore no surprise that five Swiss resorts, Gstaad, St Moritz, Zermatt, Verbier and Crans Montana, appear in the Savills Top 10 Ultra-Prime Resorts Index. The family friendly resort of Saas Fee stands out as offering a long season with good quality snow but with comparatively lower priced property at averages of between €4,000 and €8,000 per sqm. Jeremy Rollason, comments, "Verbier and The Four Valleys remains ever popular and is the destination of choice for many international buyers. Supply restrictions with the new Lex Weber law (limiting the number of second homes to no more than 20% of the total) will begin to bite in the next one to two years, once existing supply is absorbed. 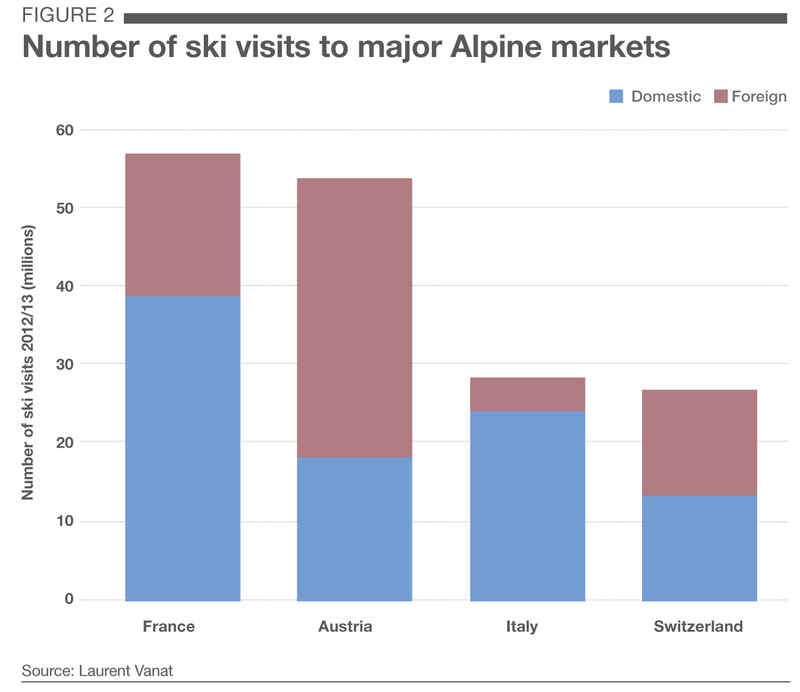 Upwards price pressure in the leading Swiss resorts is inevitable, although there are still deals in the resale market for those that shop around. " Austria's comparative affordability, dual seasonality, diverse culture and attractive rental returns make it the country of choice for those chasing bang for their buck. Indeed, rental returns of ski property in Austria are roughly double those of either France or Switzerland, at circa 5%-7% gross. 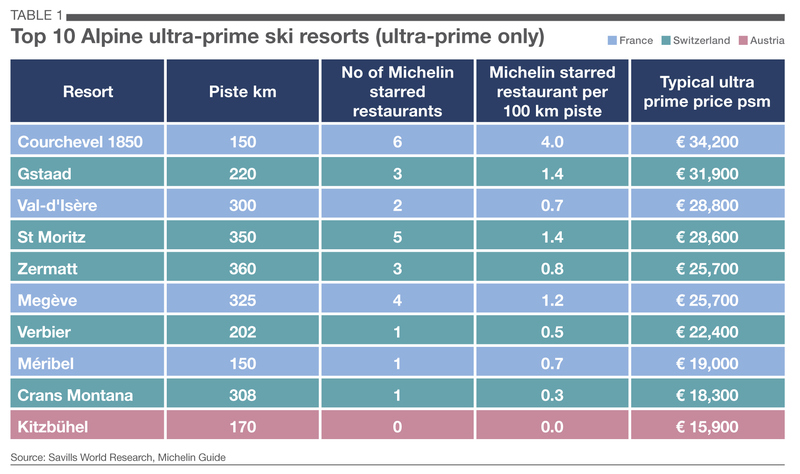 Kitzbuhel is the only Austrian resort included in the Savills Top 10 Ultra Prime Resorts Index where prices range from €8,000 per sqm to €15,000 per sqm. For buyers seeking value, Bad Gastein and Zell am See offer lower priced property and average ski conditions, although the latter boasts a particularly strong summer season. The resort of Ischgl, the Ibiza of the alps, is highlighted as one to watch. Prices here are under €4,000 per sqm. Stability is beginning to return to the French alpine market and there are still good opportunities for buyers. At the top end of the market, Courchevel 1850 continues to dominate. Prices here can reach €34,200 per sqm. However buyers looking for value should consider St Gervais which is seen as an affordable alternative to better known Megeve, with property values under €4,000 per sqm. All eyes will be on Meribel next year as it takes the global stage and plays host to the World Ski Cup finals. Prices here range from €8,000 per sqm to €19,000 per sqm and there is room for growth as its profile increases. In general, thanks to their higher altitude and geography, Swiss resorts have the longest seasons and deepest snow, the report by Savills World Research found. However, the costs for passes, food and accommodation are higher. This is shown in the Savills Kakao Index which measures the cost of a Hot Chocolate on the mountain. Skiers can pay over €6 in Gstaad, over half the price of Bad Gastein in Austria. French resorts have average season lengths but good levels of snowfall. The high snowfall resorts such as Val-d'Isere enjoy seasons that can run well into April. Morzine has a shorter season but the lift pass is almost €100 less at €176. Austrian resorts however have the shortest seasons and relatively low levels of snowfall on average. 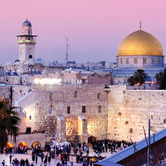 Despite this costs and property values are at their lowest here which boost gross rental yields. Miami, Manhattan, San Francisco and Los Angeles property markets have good reason to celebrate. According to European property developer MGM, British interest in buying a ski property in the French Alps is at its highest level in more than a decade.